wow! that cvm top went fast! thanks to everyone who bought. they’ll probably go to the post office on friday and i hope you all like spinning it. here’s my basic dye routine. your fiber to water ratio makes a difference as to how the dye will take to the fiber. if there’s more water, the dye has more room to move around. i have 2 crockpots, one small, one large. on the stove top i dye in a big enameled canning pot and one smaller stainless steel sauce pan. in the oven i dye in this crazy glass meat dish and an enameled turkey roaster pan. all of these were bought at thrift stores. crock pots: i always fill to over the top of the fiber, sometimes i fill all the way and sometimes i don’t. baking: i vary my water levels here. in one glass dish i use, i make sure that the wool is soaked and leave a bit of water in the bottom, but i don’t necessarily cover the wool completely. this is the best way to make the dye stay where you want it on the wool. stove top: on the stove i generally go for the more water than the other two, mostly because i can. here are several ways that i do this. remember from the dye safety stuff, that i already have all of my dyes mixed into stock solutions. if i already have colors mixed, i often apply dye with a teaspoon. lately, i’ve been mixing my colors as i dye. in this case i mix into a pyrex glass container. sometimes i add water to make the dye go further without poking, but sometimes i don’t. similarily, sometimes i poke the wool where the dye is to spread it and sometimes i just throw it on the top and see what happens. i try to resist over-poking as much as possible. crock pots: lately i’ve been throwing the dye on top and poking it a bit. then i let it cook for an hour or two, then flip it over and add more dye (usually a different color) to the back. when you apply dye to hot wool, the dye will attach almost immediately. baking: when i apply in the dryer version of dyeing, i squeeze the dye into the wool where i want it. if i use a lot of water in the oven, i often just throw the dye on and see what happens. until the dye is absorbed into the wool – and the water runs nearly clear. add more dye if you like. i always let my wool cool for a bit to absorb the rest of the dye and so i don’t have to deal with wool that hot. exhausting the dye is important so that the stuff in the dye does not go down your drain. a note about adding dye. i add dye at any time during the heating process. each will give you a different effect. rinse, spin cycle, hang, spin! 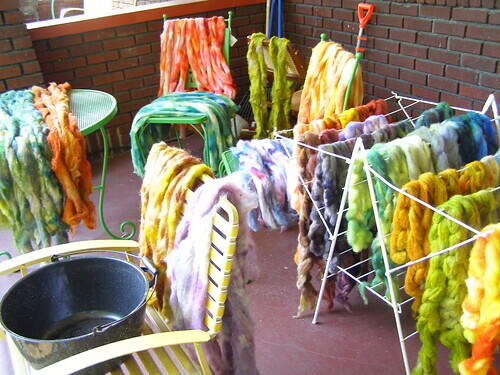 now… a note about my current experience dyeing farm wool. you may wonder why there aren’t so many people out there dyeing this stuff and i must tell you it’s way more labor intensive than dyeing commercial wool. commercial wool is compact and uniform. farm wool is usually light and lofty and each kind is processed at a different small mill, so it’s… well. different. here’s why that makes a difference. i can fit 6-8 oz of commercial wool in one particular crockpot i have… but only 4 oz of farm wool. it takes up more space. one more dye post and we’ll wrap this dyeing stuff up! if you have any additional questions, now is the time to ask. p.s. the june newsletter is here! This entry was posted in community, cosyknitsliterally, cosyspins, dyeing, knitting by cosymakes. Bookmark the permalink. Wow, what an amazing post! It filled in a lot of the blanks for me in terms of at-home dyeing. Thanks, Cosy! You should seriously write a book about dyeing/spinning. How environmentally friendly are acid dyes, natural dyes, and the dyes that you use? i had the same experience with farm wool; the first time i dyed it i was sure i was going to felt it because it was so much more delicate than any commercial stuff i had used before. but it’s totally worth the extra care you have to take! Thanks for the excellent description! This is pretty much exactly how I do it with acid dyes (except I don’t have a crockpot and occasionally use the microwave). Wow,thanks for all of the info. Any plans for a dyeing class ?